I've written before about one of my life's struggles--dealing with a rare disease that imprinted me with the largest birthmark I've ever seen. As I've dealt with my own issues, I've learned that lots of people share my struggles. Although they may not be marked in the same way I am, difficulties with self-image and acceptance affect many of us. Here's a photo of part of my birthmark. This is my lower leg, the part that everyone can see if I'm wearing a skirt or shorts. My birthmark is actually much larger than this; it extends all the way to my upper back and across my torso. A few days ago, though, I got a jolt. 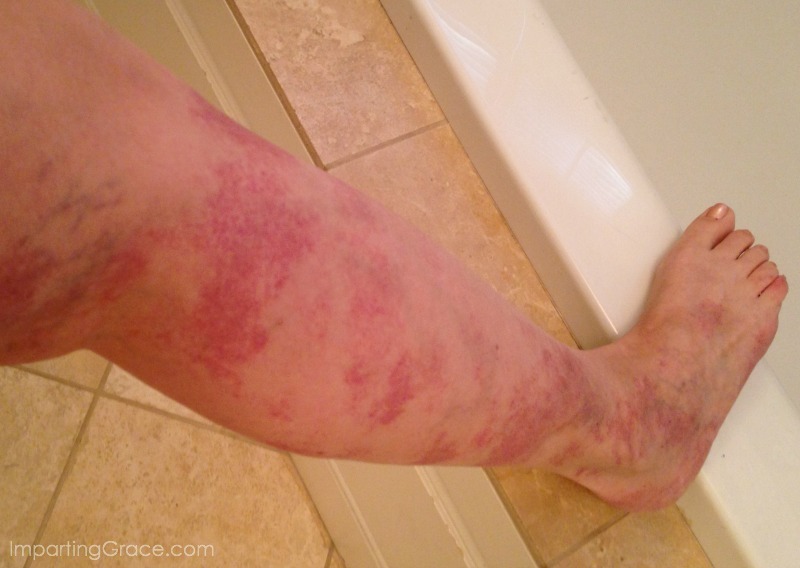 My birthmark is just one symptom of a rare disease called Klippel-Trenaunay Syndrome. I'd been advised to see a specialist just to make sure all was well, and I was fortunate to get an appointment with the Vascular Abnormalities Clinic at Duke Medical Center. Doesn't that sound like fun? 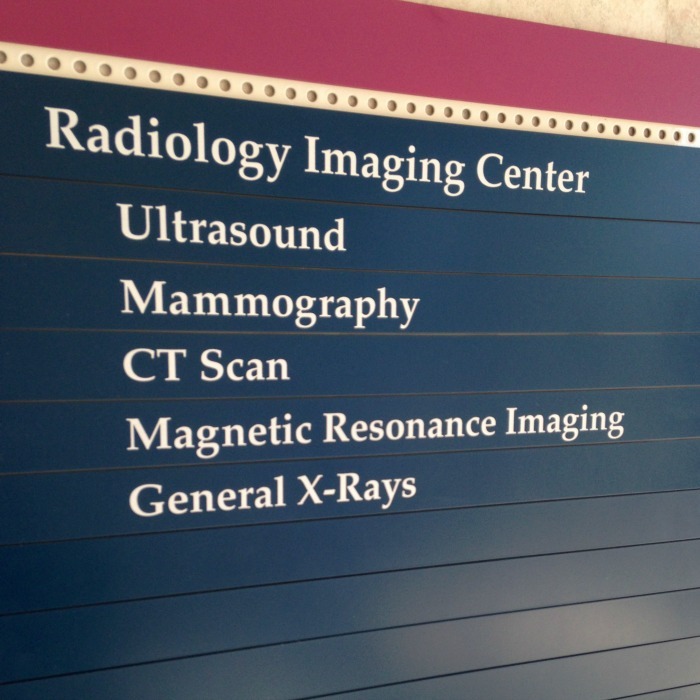 I can't tell you what a relief it was to see physicians who knew all about KTS. Usually I have to explain my disease to health care professionals; it's so rare that very few people have ever heard of it. But these specialists have treated a number of patients with the disease, and they knew what to look for. They ordered an ultrasound and an MRI of the veins in my leg. What I didn't know was that this area of my birthmark was highly abnormal for someone my age. Of particular interest was this part of my lower leg. Looks pretty bad, doesn't it? My doctors told me that this looks really good for someone with my condition. They were amazed to learn that I successfully carried three babies to term and gave birth with no complications. They told me that they'd never seen a case of KTS in a person my age with so little damage in the lower extremity. Apparently they expected that I'd have severe varicose veins and a good deal of skin damage from blood pooling in my lower leg. While I've struggled with how bad my leg looks, they were puzzled as to why it looks so good, relatively speaking. The MRI solved the mystery. As it turns out, my leg is missing a vein. My doctor called and said, "There's a lateral draining vein that should be present in your leg, and it simply isn't there." There's no way to tell why I'm missing this vein, but a problem with this vein is what would be responsible for the damage that the doctors were expecting to see. For reasons unknown, this vein simply never developed in my body. It's just not there. "We're not sure why it's not there, but you're one lucky lady," my doctor said to me. "Whatever the reason, thank God it's not there." I think that's the first time I've ever had a medical specialist say "thank God" about my disease. To be honest, I'm just floored by this news. This birthmark, which has been so difficult for me to live with, is actually evidence of a little miracle. And this has me wondering: how many "little" miracles happen in my life every day? How much of what I take for granted is evidence of God's love and provision? How many hidden healings are part of my life? Or of yours? We're so quick to question God when we see suffering and pain. I pray that we would be just as quick to praise Him when we see mercy and help. Dear God, give me eyes to see and ears to hear of Your goodness. Have you ever seen an ordinary, everyday miracle? How amazing! Our God sometimes hides those miracles in plain sight even if we don't readily see them. So thankful for this news!!! God is good and your beauty shines so beautifully from the inside out!! I thank God everyday for the "miracles" in my life...I am so happy for you! Oh Richella...this is such wonderful news! Thank you for being bold enough to share your condition in the first place but what a blessing it is to find out that you were missing the part that would have worsened the condition! Our God works His miracle in so many ways...I have experienced them too! Praise Him! What a great message you posted today! congratulations on the good news from the dr.
Richella - Thank you for sharing your miracle with us today. So often we miss seeing the things God has done and is doing each and every day. We indeed are fearfully and wonderfully made. What a blessing you are to others. Bless your dear heart, Richella! I know this has been a cross for you to carry through life. What an amazing thing to find out your cross has, all along, been keeping you from a "greater woe". We sing a song that has these words in one of the verses, "and in mercy His wisdom the flames may have sent, that my soul greater woe might be spared". I am always thinking about that "greater woe" when we go through deep trials and wondering what worse thing God is graciously and mercifully sparing us from. Oh, He is a GOOD God Who loves us, and sometimes He gives us a bigger glimpse into the depths of that love. Thank you for being so transparent and for sharing something so personal. 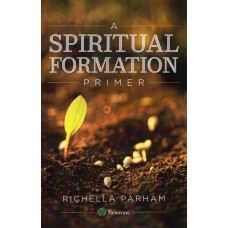 The spiritual wisdom is so profound and encouraging. Thank you so much for sharing your story, Richella. Yes, I see small miracles, but I'm sure I miss some along the way. Have to be very observant :) Thank God for your miracle and what a wonderful blessing! Thank you for sharing your story. I know that took incredible bravery and courage to open up and share photos and your feelings about it. I have a skin condition known as Vitiligo. According to WebMD it is caused by a loss of pigment in the skin, due to destruction of pigment-forming cells known as melanocytes. The exact cause of the destruction of these cells is not known. One possible explanation might be that the body's immune system destroys the cells, as in other autoimmune conditions. Although vitiligo affects all races equally, it is more noticeable in dark-skinned people. Michael Jackson was a well known person with Vitiligo. I am not dark skinned. So my patches are bright pink and depending on the time of year, darker pink (summer). I loathe my skin condition. It is on my neck and with long hair I often pin it up in the summer and I always get stares or questions about what it is...it it contagious? (no) I sadly passed it on to my two children (son and daughter). They both hate having it too. Although it is not life threatening or dangerous, like what you have to contend with, it makes us look different. I truly know now how hard it is to go through life with something you didn't ask for that makes you stand out in a crowd. Dear Richella...thank you for sharing this today. I had no idea you had that condition, but I loved hearing about the miracle connected to it! I am sure that was awesome news for you to hear. I love hearing about miracles! Our God is so amazing!!! This is not something I tell people very often, but I have cellulite really bad on my hips, thighs and arms, and have had it since I was a young woman. I never like to go swimming because it is not pretty! Even when I was thin I had it...and now that I am heavier it shows even more. I just cover it up by always wearing clothing that doesn't let it be seen...but I always know it is there. I have always hidden when I undress as I don't even like my husband to see it. Yet, even though I am self-conscious about it...I do know that I am fearfully and wonderfully made, and I accept who I am, and am so grateful for who I am in Christ. Of course, my cellulite is not threatening at all and is more of an outward sign that my system does not function as well as it should because of my many food allergies that I have had from childhood. I know more now than I ever did before about my allergies and food in- tolerances and now I try to eat well to keep my body working properly, and I avoid my known allergens, but I still get toxic at times. Anyway sweet lady, I imagine that you have had many years to come to terms with your birth mark and your health situation...but I am sure it has been filled with struggles. I just want to say again that you are such a beautiful lady inside and out, and I know that you love the Lord and have Him in your life, I know He gives you grace for each and every day, and I rejoice that you have recently heard of the miracle He has done for you! He is so good! Thanks for sharing, and may God continue to bless you and perform continuing miracles in your life! You are such a special lady. You are precious Richella! The Lord uses you in so many ways to bless others!!! Wow! I'm so thankful, too. What an incredible story. Richella, may I add an "Amen" to all comments above. You are such a beautiful woman and a birthmark doesn't change that at all. But the verse that we are "fearfully and wonderfully made" certainly comes to mind. He made you perfect in every way to have the life you are having, raising your beautiful family and sharing your heart with so many of us! Bless you for sharing this because you never know who you might touch! Blessings to you! Richella, I did not know you had a birthmark or a condition that has caused you such angst over the years. It is not so hard when you are an adult but I can't begin to imagine what you must have gone through as a child with people being thoughtless. God bless you. You are an overcomer and I have never heard you once complain on your blog about health issues. Fearfully and wonderfully made AND created in the image of God! Praising him for His mercies. 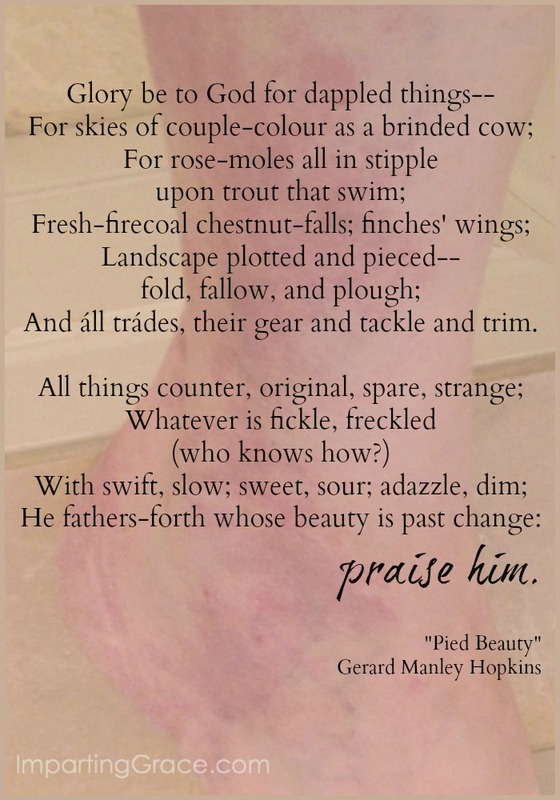 He made you beautiful inside and out! Richella, how wonderful that you got good news! It's wonderful for you to share your story and real life here. It just may reach and touch someone who is going through the same thing. Another reason I'm so thankful to live in an area of the country people travel to from around the world for medical care. Grace! Grace! God's Grace! Just think how God made a way so that your syndrome would not impact the "things" which mattered most to you. You have been so blessed to have birthed and raised such wonderful sons. Your husband must be an amazing man, Richella. In between the lines, I have sensed that you are great cherished. In addition God has given you a purpose and even a platform. His goodness is amazing. I rejoice with you at this amazing gift of no vein. Who would ever guess?! Big hugs!! Thanks for the reminder that God gives us miracles every day! Even when we struggle. Right now, we are struggling greatly financially, and sometimes I struggle with it, but still I know that God will provide for us. Thanks again for posting this! I think I just deleted my previous comment. Anyway, I love to call them tender mercies -- little signs that God is everywhere in our lives if we choose to look. 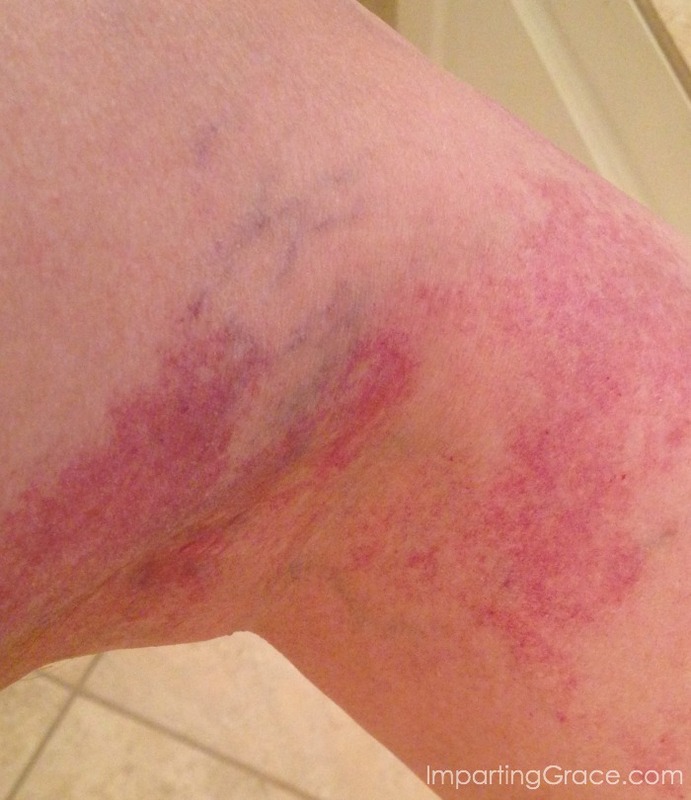 I'm so grateful for your missing vein as well, thank you for sharing your story ♥ I have awful varicose veins Richella, as in I hardly ever wear shorts and when I wear skirts I wear thick nylons and they are getting worse. I love your perspective in this all and really I should be so grateful for these legs that have taken me through a wonderful life no matter how ugly they are. Hello.....I was googling vascular birthmark on the leg pictures and found your photos and story. I also have a large very dark red vascular birthmark on my left leg and have suffered from self esteem issues as a result. 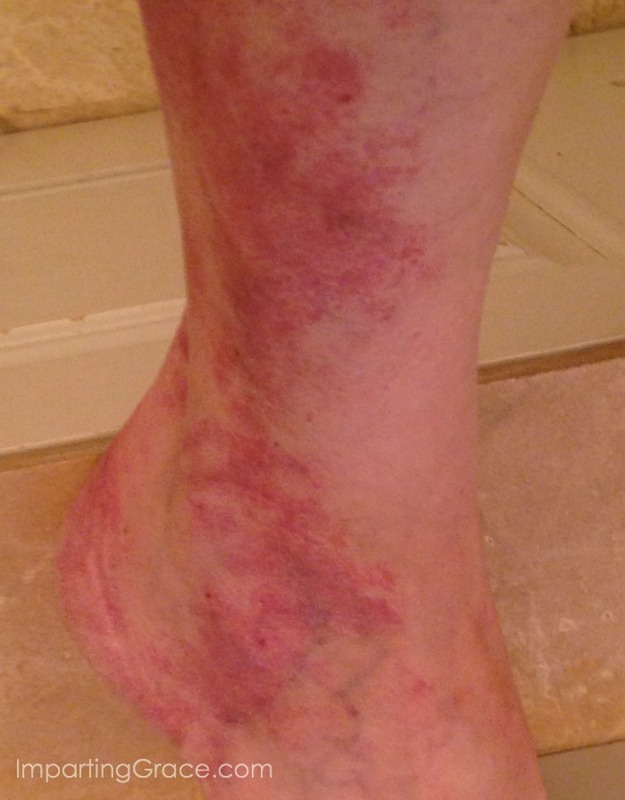 I have had this since I was born (I am 49 now) and I too am starting to have spider veins in it as well as swelling in my lower leg. I am concerned but not sure what I should do about it. Do I go to a dermatologist or to an orthopedic doctor? I'm not sure the birthmark and the swelling are related. Karen, I would suggest you see a vascular surgeon. If there's a medical school in your area, call and ask if there's a specialty clinic for patients with vascular abnormalities. I would suggest that's a good place for you to start. And by all means, email me or message me on Facebook; I'd be glad to talk to you about your birthmark. God bless you!